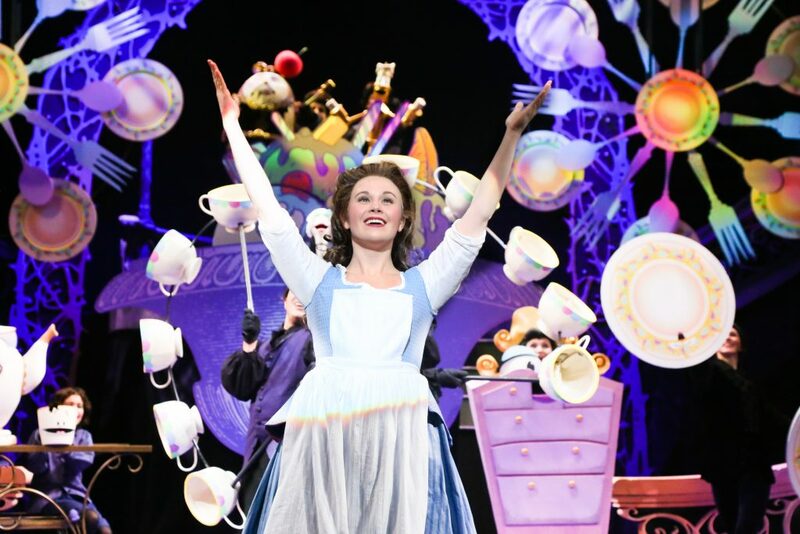 Twenty-four years ago, the Disney organization made its first foray onto Broadway with a stage version of its Oscar-winning animated feature, Beauty and the Beast. Reviews were lackluster, often noting how literally the material was transferred to the theater, not unlike a theme park attraction. Still, the show became an extraordinary commercial success, running for more than 13 years. Curiously, then, Disney’s second Broadway musical, The Lion King, went in a completely different direction, taking enormous artistic and stylistic liberties with the popular cartoon. That is exactly the element the Maltz Jupiter Theatre emphasizes in its version of the classic tale of the transformative power of love. The various inanimate objects that populate the Beast’s castle – Lumière the candelabra, Cogsworth the clock, Babette the saucy feather duster – are now all puppets, manipulated by their human precursors hidden behind them in plain sight. Et voilà, as Lumière might say, the production has a fresh look which gives the overly familiar story a new vibrancy. Rather than opting for a director from its usual corral, the Maltz tapped Tony nominee John Tartaglia, a former Sesame Street puppeteer, original cast member of Avenue Q and a veteran of Beauty and the Beast’s Broadway production. The puppets come from New York’s Puppet Kitchen Intl., the Maltz’s go-to marionette design house (The King and I, The Wiz), brimming with ingenuity and humor. 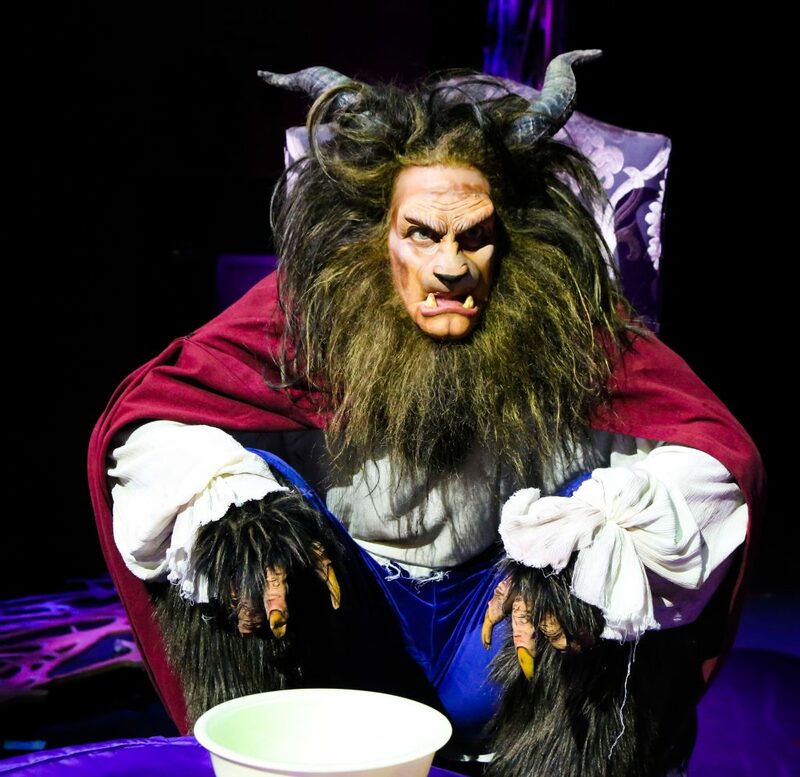 In his opening night speech, Maltz producing artistic director Andrew Kato described this Beauty and the Beast as “reduced and re-envisioned.” Wisely, I guess, there is no attempt to compete with Disney’s level of spectacle, and sometimes it is missed. The first act’s penultimate song, “Be Our Guest,” exists to be spectacle and despite some clever ideas from Tartaglia and his choreographer Shannon Lewis, the production number underwhelms. There is much talk of the Beast’s huge library of books, but when we are eventually see it, the visual has little impact. And the Beast’s transformation back into the prince he was before being cursed by an ill-treated witch is about a quart low on magic. Similarly, Zach Nadolski is plenty gruff and hot-tempered as Beastie, yet he eventually engenders wells of audience empathy. And he ends the first act with a powerful rendition of “If I Can’t Love Her,” arguably the best of the songs added for the stage show. 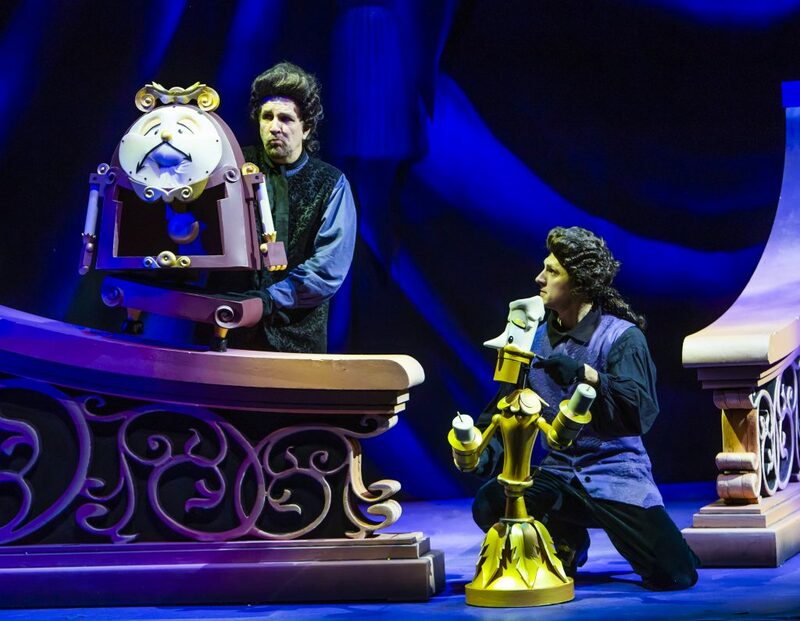 Brendan Malafronte (Lumière) and Paul Louis (Cogsworth) sustain a nice running comic byplay throughout the evening, Laura Turnbull is aptly maternal as Mrs. Potts and solos well on the show’s title tune. And as comic book villain Gaston, Kevin Hack is a fine-voiced muscle-bound doofus. Because of the many stage effects, scenic designer Adam Koch and lighting designer Rob Denton are forced into a visual palette of black, hardly the color of musical comedy. Costumer Ashley Rose Horton has no such limitation, so she fills the stage with period finery, particularly a few knockout gowns for Belle in the late going. Marty Mets does his usual solid job on sound, though he needs to re-record the muddy opening narration. And from the opening downbeat, it is evident that the Alan Menken/Howard Ashman/Tim Rice score is in good hands with music director Helen Gregory and her 11-piece (!) orchestra. for a new take on the material. BEAUTY AND THE BEAST, Maltz Jupiter Theatre, 1001 E. Indiantown Road, Jupiter. Through Sunday, Dec. 16. $60-$120. 561-575-2223 or visit jupitertheatre.org.